Ski resorts in Quebec have all the ambiance of the European Alps. There is a French flair to skiing these Laurentian Mountains, from the French language spoken to the après ski, and the overall joie de vivre of its people. There are old world chateaux and modern slopeside resorts for your family to choose from. The northern location means plenty of snow and an inherent love of winter by its inhabitants, hence some of the best family ski resorts in North America are in Quebec. Tremblant is like a Disney North for ski families- with its beautiful mountainside village, excellent lesson programs, indoor waterpark and wonderful après ski. Plentiful lodging options exist from on mountain condos to four star hotels like the Fairmont Tremblant – as close to the gondola and lifts as you can get. Quebec City , east of Montreal, is where winter is a celebration from the annual Carnival to the carving of an ice hotel. A ski trip to Quebec City is ideal since there are three ski resorts within an hour’s drive of Quebec City. You have the best of both worlds, a four century old fortified city full of historic sights and superb restaurants. Top hotels like the landmark castle – Chateau Frontenac, which your kids will think looks like Hogwarts from Harry Potter, to Hiltons, to the delightful boutique Hotel Le Germain Dominion in the oldest part of the city – Place Royale. 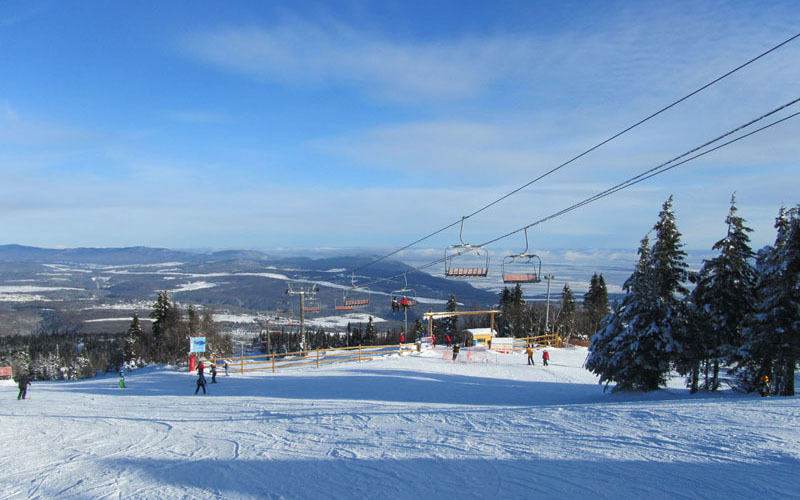 Enjoy the city by night and hit the nearby slopes of Mont Sainte Anne, Stoneham and Le Massif by day. For on mountain lodging, the Chateau Mont Sainte Anne is perfect for families- the only ski in ski out hotel in this region, so you can ski first tracks, enjoy the outdoor spa with a view of the slopes, even night ski on the 19 lit trails, knowing your bed is just steps away from Mont Sainte Anne’s base to summit gondola and over 60 super ski trails. Le Massif is a fascinating story itself, since the owner of Cirque du Soliel has purchased the ski resort and invest over $200,000 in lifts, snowmaking, a train from Quebec, and a modern hotel –Hotel Germain Charlevoix in nearby Baie St Paul. This region of Charlevoix is a UNESCO World Heritage site, and a delight for skiers. Wait till you see the view as you descend the slopes toward the St Lawrence Seaway at either Mont Sainte Anne or Le Massif – spectacular. Come north with us an explore Mont Sainte Anne, Le Massif, Stoneham, Mont Saint Sauveur,Tremblant, Orford, Sutton, Gabriel…to name a few!